Jazz Carlin is pleased with her good start to a season as she aims to reach an Olympics for the first time. 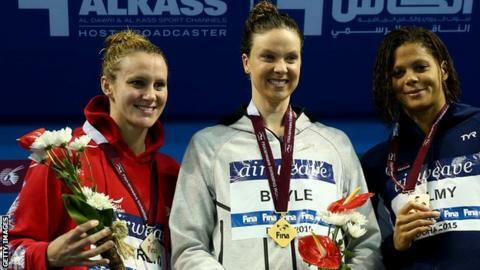 The Welsh swimmer, 25, claimed silver medals in the 400m and 800m freestyle at the World Cup in Doha this week. But after missing out on the 2012 Olympics through illness and a resulting lack of form, Carlin aims to win her place for Rio 2016 at the Great Britain trials next April. "All I want to do is be at the Olympics," Carlin said. "That's one thing I've never been able to experience. That's what I'm training for. "Obviously the Olympics is at the back of everyone's mind, but for me first is the Olympic trials to try and get your place on the team. I don't want to take anything for granted." In Doha, the two-time European champion was pipped to gold twice by Lauren Boyle of New Zealand but is pleased with her form so early in the season. "It's always disappointing when you come second behind one of your rivals, but from where I am right now I'm pretty happy and definitely looking forward to the next stop in Dubai," said Carlin, who won 800m freestyle gold in 2014. "Some people are focusing a lot on these World Cups, whereas for us it's more like a training swim. "It is nice to start the season off with some competitions which don't have too much importance. "So I'm really happy with how things are going now, but it's about building on that. "It's just about getting into the new season and I've got the European Short Course Championships coming up in December [in Netanya, Israel], so it's about getting some race practice in and getting used to racing again."